Ever seen a truck roll out solar panels like carpet? Renovagen, a company formed in 2012 to develop the rollable solar array, has developed a large-scale portable solar power unit of high-efficiency panels which could help generate instant energy in disaster areas. The ‘micro-grid in a box’ can be used for disaster relief where power systems have been knocked out, mining stations located in areas without any power and even festivals and filming. ROLLARRAY can be transported by any 4X4 car. The large steel container contains a long spool of solar panels, all attached together on a strong flexible fabric that can be pulled out into a 50-metre long system in a matter of two minutes. 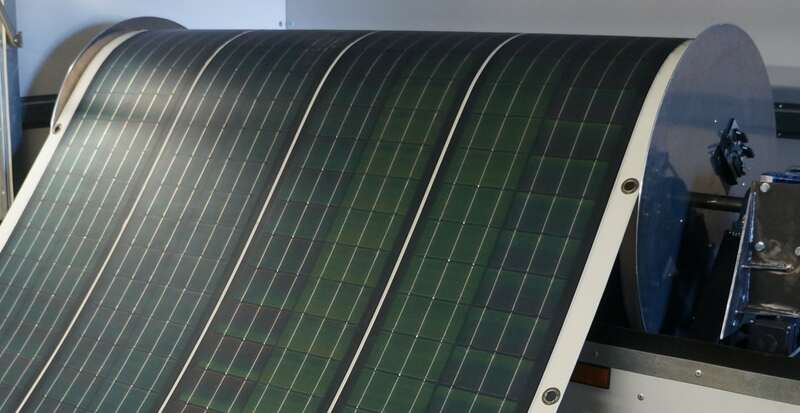 The system uses copper indium gallium selenide solar cells (CIGS) that are bonded with a tensile fabric so that the strength of the combined material can cope with being rolled in and out. Future plans are for a much larger-scale solar power unit, which will be the size of a shipping container, but will have a capacity for an array measuring 5-metres wide and 200 metres long. Tags: Climate, Concentrated solar power, Environment, Renewable energy, Solar, Solar energy.